Rivlin hosts signing for cooperation between Israel National Academy of Sciences and Humanities, American National Academy of Sciences. 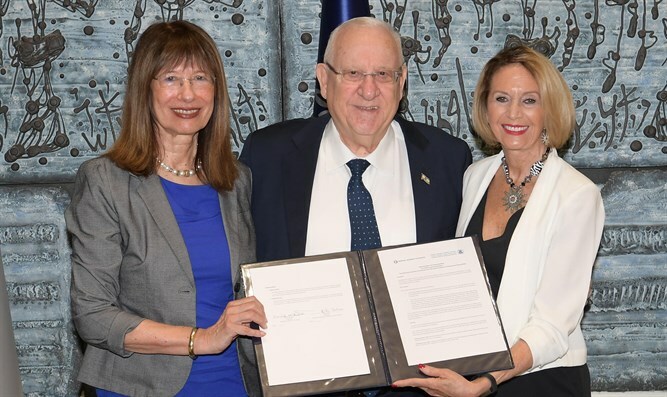 President Rivlin on Sunday hosted the signing ceremony for a cooperation agreement between the Israel National Academy of Sciences and Humanities and the American National Academy of Sciences. President of the National Academy of Sciences and Humanities Professor Nili Cohen, President of the National Academy of Sciences Professor Marcia McNutt and Alex Blavatnik also participated in the ceremony. The scientific cooperation between the two academies has been made possible with the support of the Blavatnik Family Foundation. The National Academy of Sciences is a non-profit organization based in Washington, DC, which provides independent, objective advice to the nation on matters related to science and technology, is committed to furthering science in America and which provides scientific advice to the government ‘whenever called upon’. The Israel National Academy of Sciences and Humanities is the senior body in the Israeli scientific community. Founded in 1961, it brings together the best scientists in Israel to advance scientific discovery, to advise the government on national science policy and planning, to cooperate with international partners and to represent Israeli science in the international arena.